The Ranger was designed to fit perfectly atop any AR or similar platform with loads of high-performance features, all while staying within the optic requirements for popular CMP Service Rifle competitions. The Ranger features a durable, one-piece aluminum tube, complimented by tall, exposed tactical turrets for precise dialing and ample range of adjustment. A true 1x on the low end provides red-dot-like speed in close-quarters engagements, while the 4x optical system allows shooters to magnify their target 4x for more accuracy on mid-range shots. Rounding out the impressive feature list for this surprisingly affordable optic, hunters and shooters alike will appreciate the illuminated reticle, providing excellent low-light reticle visibility. Tube Size 30 mm diameter provides maximized internal adjustment and strength. CRS™ Zero Stop Customizable Rotational Stop (CRS) aids in return to zero after dialing temporary elevation correction. Precision-Glide Erector System This system ensures the components in the zoom lens mechanism glide smoothly and cleanly through all magnification ranges. Radius Bar Fiber optic turret rotation indicator provides a highly visible and tactile point of reference for turret rotations. 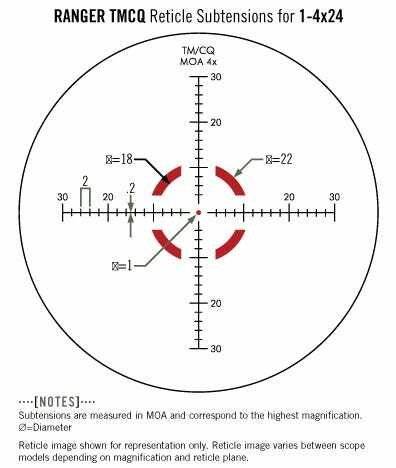 The TMCQ (Tactical Milling Close Quarter) is a hashmarked ranging reticle using MOA-based subtension lines for ranging, holdover, and windage corrections. 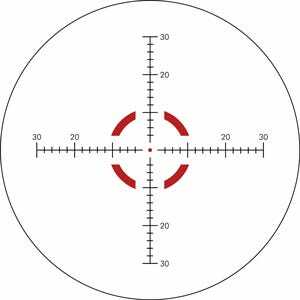 Subtension detail for the Ranger 1-4x24 riflescope with TMCQ MOA reticle.